SCUBAFISH Zanzibar is a PADI dive centre located in Matemwe. Matemwe is on the north-east of Zanzibar, close to famous Mnemba Atoll. Mnemba Atoll is a beautiful island and its surrounding reefs that measures around 15 square kilometers. This conservation area is a magnet for divers and snorkelers who enjoy swimming in the turquoise waters, famous for its healthy fish life. Here you can find the playful bottlenose dolphins, turtles, Spanish dancers, giant groupers, sharks, barracudas and other impressive marine life. Mnemba atoll is suitable for divers of all levels from novice to experienced divers. Join us for an ultimate snorkeling trip and get the chance to swim with the bottlenose dolphins (80% chance). SCUBAFISH Zanzibar offers all PADI and SSI courses from Discover Scuba Diving/Try. Scuba Diving up to Dive Master. We pride ourselves on our personal service. All our dive instructors and dive masters are highly qualified professionals and they enjoy sharing their passion with others, making diving and snorkeling with them a great experience! We guarantee small groups and a very relaxing atmosphere to learn. Customer safety is our number one concern and at SCUBAFISH Zanzibar all our equipment is in top condition. We have a qualified SCUBAPRO and Cressi technician who checks and services our Scubapro and Cressi regulators and equipment regularly. With SCUBAFISH Zanzibar you are assured of clean, pure air and we are proud to let you know that we have a “pure air” certificate from BAUER Compressors. 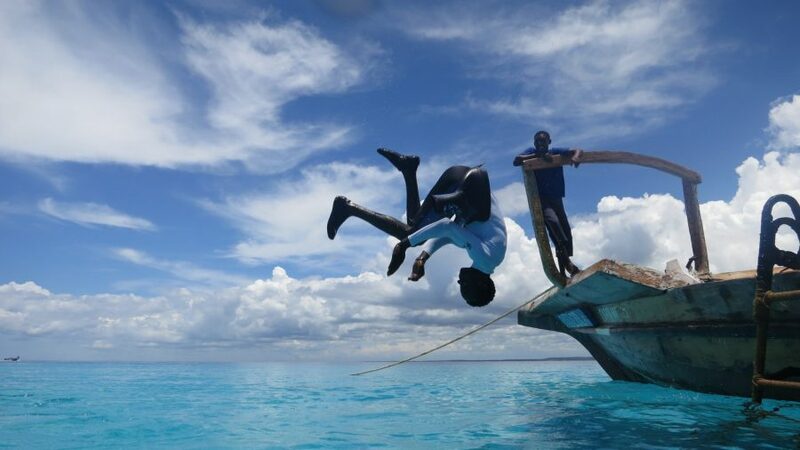 Jump on board with SCUBAFISH Zanzibar and discover life below the waves at Mnemba Atoll! Dive in small groups with an experienced DM or instructor. Safety first, but we never forget to have FUN! High quality diving and snorkeling gear. We provide Zanzibar snacks, fruits, spice tea and bottleof water on all our trips. Free transportation to and from your hot el in Matemwe area, up to Kiwengwa. We have a pure air certification from BAUER, you are always sure to have good quality of air. Comfortable dhow boats and speed boat designed especially for diving. Learn to dive in small groups and with personalized instructions. We can teach the PADI/SSI courses in the following languages : English, Dutch, German, French, Italian, Kiswahili, Spanish & Chinese. A wooden dhow boat that is 14m long and powered by twin 90HP Mercury Optimax. Carrying capacity is max. 18 people. 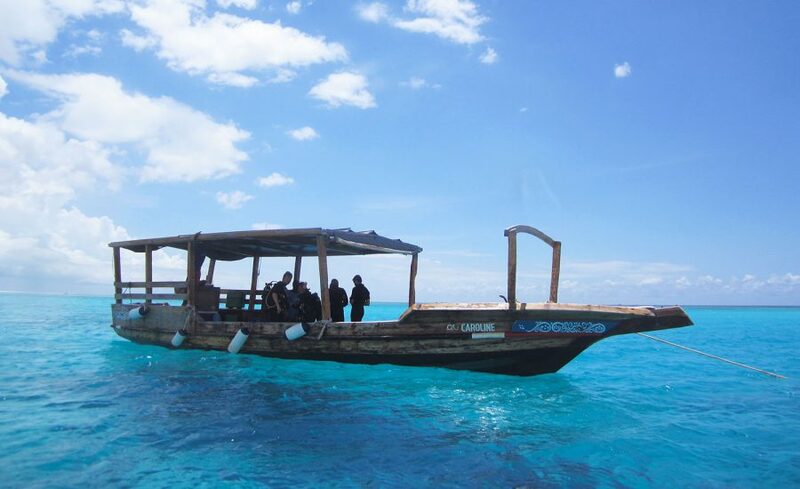 This spacious beautiful handmade dhow boat will bring the divers and snorkelers in 30 minutes to Mnemba Atoll, and offers both a roof for shade and a sundeck. 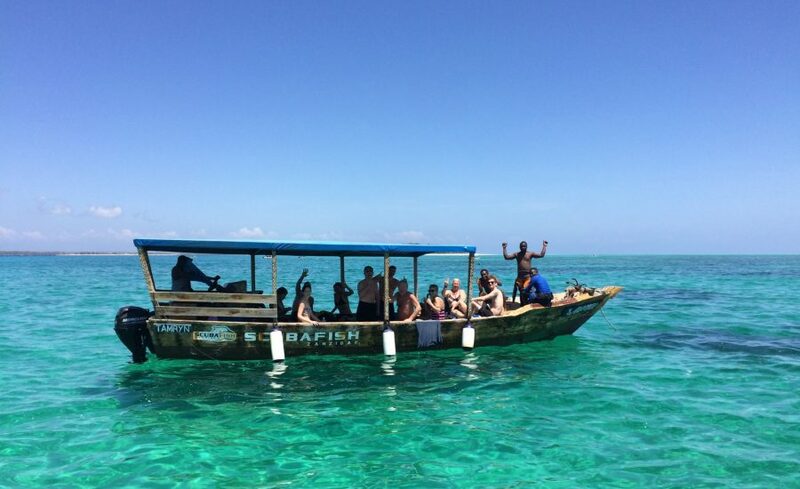 Enjoy the boat trip and feel the Zanzibar breeze. This wooden dhow boat is 10 meters long and powered by twin 30HP Mercury engines. It can take up to 14 people. Tamryn has a sundeck in the front and a roof for those who prefer to stay in the shade. In 30 minutes the boat will take you to Mnemba atoll for diving and snorkeling. An 8 meters inflatable boat with twin 90 HP Optimax motors. This boat will take a group of 8 divers or 10 snorkelers only in 10 minutes to Mnemba Atoll. 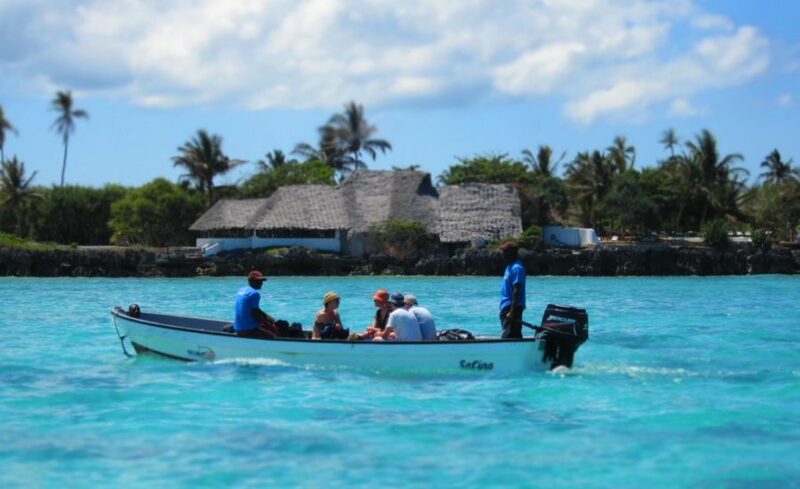 The Alice is perfect to reach the deeper dive sites in the east and the more remote places of Mnemba Atoll. Safina and Juliet are our 8 meters tenders that are powered by a 40HP engine. 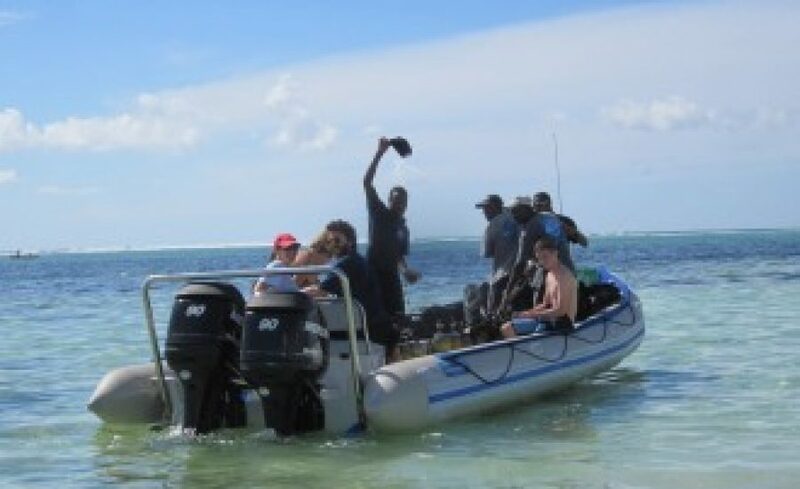 They always accompany our dhowboats to pick up divers and snorkelers.